July was a very busy month at the yard. 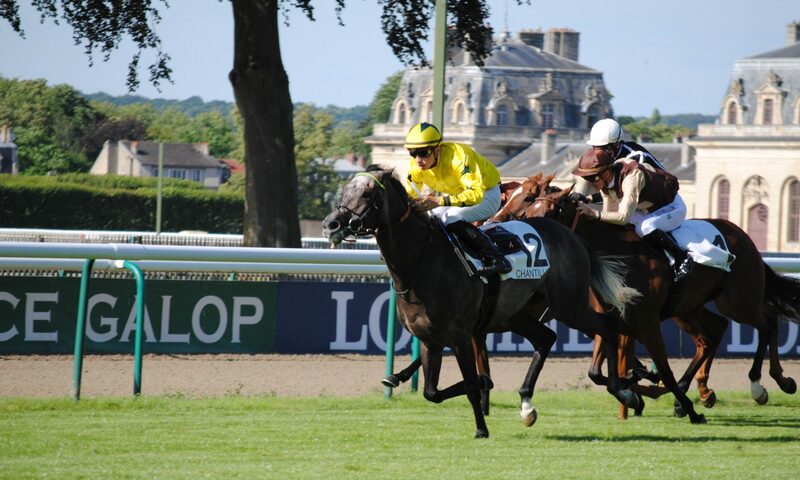 Avenue du Monde (Champs-Elysees) ran her final race, we attended the Tattersalls Horses in Training sales in Newmarket, two new horses entered the yard from claiming races – Never Compromise (Astronomer Royal) and Surewecan (Royal Applause) – and we ran the racing festival in Vichy. Avenue du Monde’s last race before becoming a broodmare was in Vichy on the 20th of the month, the last day of the festival. We were hoping that she would drop to the third division of the handicap that day but ended up in the second with Grey Sensation (Aussie Rules) and Gascon (Heliostatic). Gascon proved to be the best of the three on the day finishing a good second while Grey picked up fourth and Avenue was just out of the money at sixth. By then, we were running on a turf that was well worn from the week of racing and the heavy rain that fell the Monday before and again that day. Earlier in the month, we took Ray of Hope (Layman) back to Deauville and the fibersand and he ran much better than his previous outing at Longchamp. This time picking up second place, one of two that he would run this month. Ray of Hope earing the yard its 19th second-place finish of the year in Deauville, the 31 July 2018. Further notable runs included Gascon again, finishing fifth at Compiegne, Never Compromise was seventh in a Quinte handicap and Mr. Chuckles (Arcano) adding a seventh in the second division of that same Quinte handicap. The Mickaëls – Forest, and Barzalona – did most of the riding except for Mr. Chuckles who was ridden by Delphine Santiago and Maxime Guyon who rode Gascon in Compiegne. The best paying horse in July was Ray of Hope with his second place on 4 July, paying €9,90 for a one euro place bet. Who says they don’t talk? I’m sure horses get as frustrated with us as we do with them when things get lost in translation. But Strictly Rhythm knocked us over the head with the message today: She is ready for vacation, and NOW. She ran at Compiegne in what should have been a pretty easy handicap. Like all trainers with talented by still-maiden fillies, I really wanted to get a win on the books this year because Strictly is likely headed to stud at some point. But I knew we were in trouble when she went into the starting gate like a lamb. Usually, she throws a tantrum behind the gate, and the bigger the tantrum, the better she runs. The few races when that hasn’t happened were her few bad performances. Today, she was slowly into her stride, comfortably settled into second place, accelerated a bit in the stretch but clearly wasn’t going to push it when the other horses went with her. For the first time, she didn’t really try and wasn’t interested in racing. She came back hardly blowing and was more interested in bossing around other horses and looking for food than anything else. Her owners have yet to decide her future, but I’m really hoping we can give her a bit of a rest and then come back at it as a four-year-old. She has been very unlucky not to have won already; she’s finished with a length of fillies that have gone on to place and win at Group and Listed level. Her handicap mark has now dropped to a reasonable level, and I’m absolutely convinced she will win if we get the chance to go on. Meanwhile, I’m hoping Rendition doesn’t get eliminated on Friday. She’s entered on the all-claiming card at St. Cloud, but there were 80 entries and only 15 forfeits, so there will surely be eliminations. She has a backup entry at Deauville next week. She has been off after a hairline fracture this spring, and we’re eager to see if she has the stuff to be a racehorse or not. Like Strictly, I’m sure she’ll let us know. Strictly Rhythm is either the luckiest or unluckiest racehorse out there, depending on how you look at it. We went to Lyon on Tuesday with a good chance; according to the form, the worst that could possibly happen is we would run third. But racing is racing. It has been unseasonably hot and dry in France, which can turn some synthetic tracks, like the one in Lyon, to mush. Fearing just that, the groundskeepers poured water on the thing all morning and then sealed it, and sealed it good. The tractors were rolling nonstop for three hours Tuesday morning. I thought they would have to then follow with a harrow, but no, they were going to leave it like that, the president of the course said. I thought the surface was awfully hard, and didn’t like it, but Jean-Claude Rouget, who was running the favorite against us, said he thought it was safe. “We’ve never had an accident,” the president chimed in. Famous last words. Strictly was laying second behind the leader coming out of the final turn, and just as they started to accelerate, the horse in front of us shattered a leg in one of the ugliest accidents I have ever seen on a racecourse. Strictly avoided the crash by millimeters, thanks to quick thinking by Fred Spanu, our jockey. Strictly ran on well, but the bobble to avoid the accident costs us third place by a short head at the line. Rouget, of course, won. Strictly still brought home money, and she came back sound (and alive, which is more than the connections of the other horse can say). So we were very lucky. But we’re still looking for her first win. The bright side is that her handicap mark has now dropped to a reasonable 32, which means I can now place her in some easier races. She will probably go to Compiegne in just under two weeks. Meanwhile, we’re off to St. Cloud today with George, who will get his blinkers this time. This probably really WILL be his last race, so we just want to have fun and come back safe. Then it’s on to Longchamp for a weekend of being a spectator for the Arc and associated group races. We have lots of out-of-town visitors and we’re planning quite an Arc party. I can’t get too carried away because I have to get Magical Flower to Argentan for a race on Monday. It’s been a little hectic so tough to keep up the blog – I’m way behind because we had a win last Sunday in St. Malo with Rose Fleur and a few places with some of the others. Rose won nicely. She is a huge filly, and it was almost like watching an adult compete against ponies – she literally towered over the opposition. She will be a better three-year-old, but seems to be racing well despite her ungainly size. 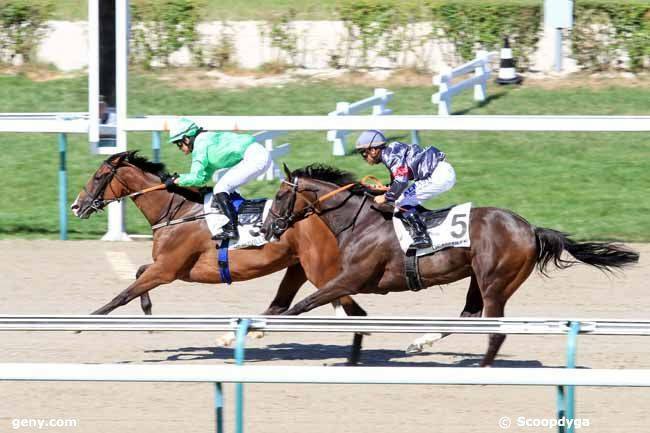 Strictly Rhythm tried her first handicap on Sunday at Chantilly, and that went less well. She was slightly out of sorts in the morning and I almost declared her a non-runner, but decided to go ahead after all. 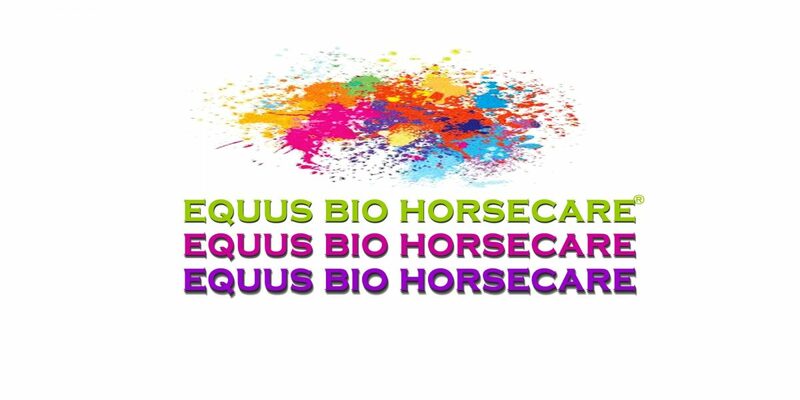 I think she is having some serious female issues at the moment, and she had a bit of a stress colic that passed quickly, but is still worrying. We decided to run her from behind, because I expected there is usually better pace in these big handicaps than in the condition races. Unfortunately, that turned out not to be the case, and they were again crawling until the final turn. She accelerated well in the stretch to finish 8th of 16, and she came back fine, which was the essential. I’m going to give her a bit of a break and have her well sorted for her next try, which should be on Bastille Day at Longchamp. Talawa managed to snag a 5th place in a claimer in Aix-les-Bains, but she is still not really catching on to the game. It was a seriously weak field, and blinkers didn’t give us too much help. She needs more time and may go to the sales. 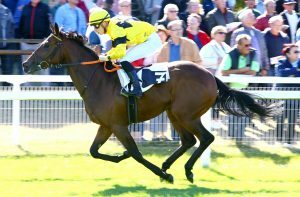 We also were unlucky at Compiegne on Tuesday with Justthewayyouare finding the company a bit tough after moving up both in class and distance. He finished only 6th, but he is a good horse and we’ll find something a little easier next time out to give him confidence. He’s a very laid-back guy, and has a lot of potential. George had a crack at an easy handicap that day and didn’t really fire, either, but I’ve not really been able to get him back in top condition since his Guernsey trip. I’m not sure why, so I’ll keep trying to figure it out. Meanwhile, he’s on the easy list. Things looked up yesterday with Hold That Emperor running a very nice third in Chantilly. He might have done even better than that, but we tried to relax him behind another horse, which wasn’t a good idea in the end. He was just behind the eventual winner, but he pulled like crazy and then lost his balance a bit when finally given room to run. Next time out, we’ll let him find his action and just roll along, and if that happens to be out front, so be it.